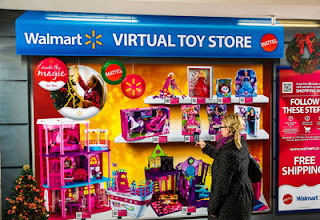 Walmart has opened a virtual QR Code toy store in an underground walkway in Toronto, Canada. It uses the walls located in the 17-mile PATH underground walkway in Toronto which links thousands of commuters each day to public transportation, office buildings, hotels, and stores. QR Codes are shown with popular Mattel toys on a giant 3D poster. Commuters can use their smartphones to scan the QR Codes and purchase holiday gifts from Walmart with free shipping. There are more examples of virtual QR Code stores. Click here to see post and video of a virtual QR Code grocery store in a Korean subway station. Click here to see post about virtual QR Code grocery store in a Chicago subway tunnel. How about a virtual pizza shop or Chinese restaurant on a bus stop shelter? Have it delivered hot right when you get home! If you open or see a virtual QR Code store, let me know about it here or at QRickit.com.